Hearing Loss can be caused by a wide variety of things. Long term exposure to loud sounds is the most common cause of hearing loss. 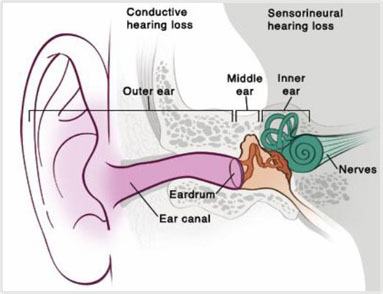 Viruses, illnesses, certain types of medication and traumatic injury can also cause hearing loss. There are also hereditary factors that can come into play, so it’s important to get your hearing tested. Schedule an appointment with one of our Maine offices today. 1 out of every 100,000 children are born with hearing loss. And a study showed that 15% of college students have a hearing loss by the time they graduate. Even animals can suffer from hearing loss. We have even built several Hearing Instruments for dogs! Hearing Loss – It’s not about age. Did you know that the number of people with Hearing Loss borders on epidemic levels? have enough hearing loss to warrant the use of hearing aids. Finetone Hearing conducts advanced hearing tests to come up with the best solution you need and we back them up with top notch service. For more information on hearing loss contact us today.